What??! You've never before prepared a spaghetti squash?? No problem! Here is everything you need to know! assure maximum ripeness and therefore sweetness. Make sure that it's nice and firm, with no bruises or soft spots. 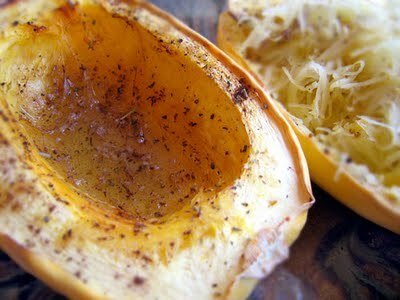 The quickest, easiest way to prepare a spag squash is to roast it. Because it has a very mild flavor, it acts as a perfect substitute for regular spaghetti noodles. And it's naturally gluten free too! It's also much lower in calories and fat than wheat pasta. 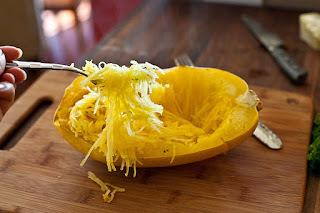 Here's how to roast a spaghetti squash. It's super easy- you'll see! Wash and dry your squash. Now, you can bake it whole or cut it in half lengthwise. If you keep it whole, just make sure to pierce a few holes with a large knife to allow steam to escape. If you prefer to cut the squash before baking, just cut it in half and scoop out its insides. Then, place the whole squash or two squash halves cut side down on a parchment paper lined baking sheet. I sometimes like to fill the cavities with delicious things like fresh thyme sprigs or garlic. Bake at 400 degrees about an hour or until the skin gives easily under pressure and the inside is tender. If left whole, you should be able to tell when it's done by piercing it with a regular fork. If you've halved it, you'll know when it's cooked because the strands will separate and the squash will be sweet. 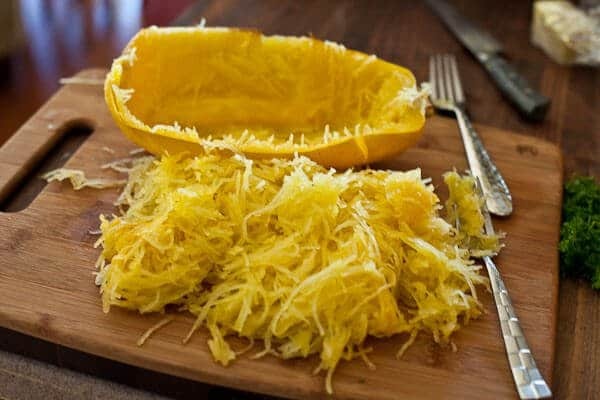 Once the squash is cooked and cooled, if it hasn't already been cut, halve the squash and scoop out its insides with a spoon. You can compost the seeds or save them to bake for a tasty treat, similar to pumpkin seeds. Then take a fork and scrape out the squash flesh little by little. It will naturally separate into fun noodle-like strands. Toss the strands into a bowl and mix with a little olive oil. Now we're ready to make our meal! So now that you know how to roast the squash to perfection, let's make something awesome with it! Spaghetti Squash with Vegetable Lentil Medley! 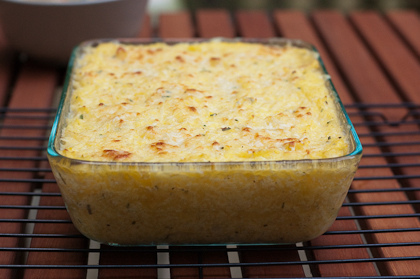 Preheat oven to 400 degrees and bake the spaghetti squash according to the directions above and set aside. To prepare the lentils, add them to a pot of water and season the water with leeks, garlic, cumin and some salt and pepper. Cook the lentils until tender, but make sure they don't turn to mush. We want them to stay firm and have a nice bite to them. If the lentils are ready but there is still a little water remaining in the pot, just turn the heat to high and let the liquid evaporate while constantly stirring the lentils. Mix in several tablespoons of mustard and balsamic vinegar. Season with salt and pepper and fold them into the squash strands. Squeeze out as much juice from the grape tomatoes as possible. In a large bowl, toss the tomatoes with olive oil, garlic and dried Italian seasoning. Do not salt just yet. Adding salt at this stage will just pull the water out of the tomatoes as they cook and they will have a difficult time roasting. They might just boil instead! NOT what we want. Broil for about 15 minutes or until the tomatoes are dehydrated and starting to caramelize. Remove tray from oven and push the tomatoes over to one side of the tray. 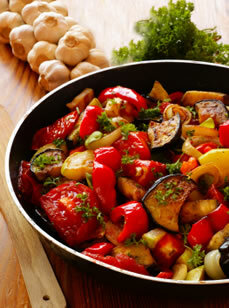 In the same bowl that you used for the tomatoes add the zucchini, leeks, mushrooms, red pepper, garlic and onion. Toss with a drizzle of olive oil, ground cumin and black pepper. Add to the empty side of the baking sheet. Broil for about 15 minutes or until veggies are nice and roasted. Remove from oven and stir the veggies. Season with salt and mix in the frozen peas and a little more balsamic vinegar. Mix the the roasted veggies in with the lentils and squash strands. ! Garnish with the toasted pinenuts and vegan Parmesan ! Make a sauce with some roasted eggplant, white wine and top dish with some homemade breadcrumbs fried with garlic, herbs, nutritional yeast and olive oil. Try tossing strands of spaghetti squash with some basil pesto, roasted red peppers, white beans, spinach and rapini. Sun dried tomatoes packed in olive oil and herbs are delicious. Maybe a few green olives too. fun to make a vegan version!